Also want some Izzet to be anti-Bolas, but that's just me being selfish & still wanting to root for my favorite guild. There's a simple solution to that: Root for Bolas. Ew no. I want him to just die. Giant golden jerk. But to be fair I don't have the same kind of connection to the character people who've been playing for longer have, since I only got into the game with Innistrad and haven't done a deep dive into the old lore. So IDK, for me there is nothing sympathetic about him at all, but that may not be true from other's standpoints. Bolas is the kind of character that shouldn't be sympathetic (which is why the recent storyarc was duuuuuumb) but is supposed to be a bit of a power trip character. MaRo revealed that part of the autumn look is them going for a film noir/cold war feel. 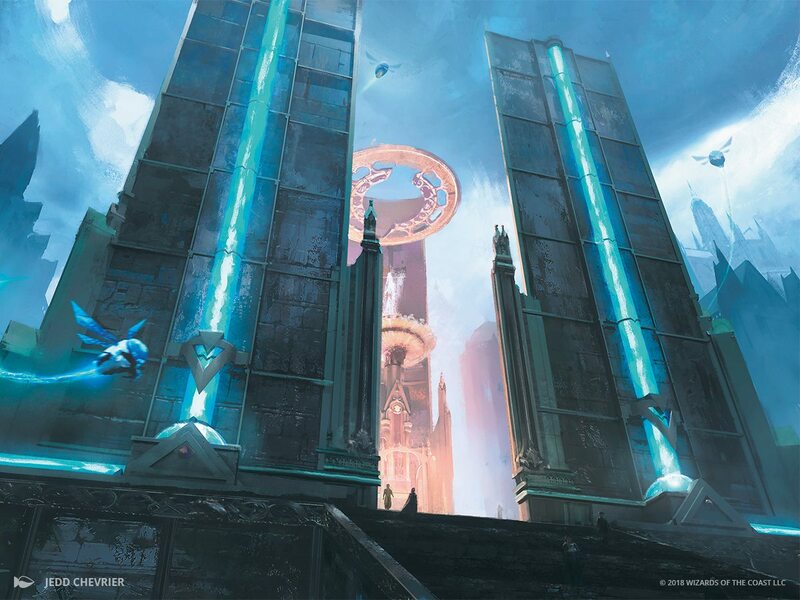 He also revealed that part of how the guilds were divided between the sets was to have two Bolas-aligned guilds in Guilds of Ravnica and three in Ravnica Allegiance. They will also have planeswalkers as leaders. As Assassin's Trophy (x) shows Vraska killed Isperia, I am expecting Dovin Baan to take over and put Azorius under Bolas. Tibalt popping back up to take the Rakdos would be interesting. Domri falling for Bolas seems like a wild card. Kiora for Simic?? I think Orzhov makes sense under Bolas, but the mechanics will be interesting. Either Liliana comes in as white-black for the first time and uses necromancy to take control of the Ghost Council or Kaya comes in working for Teysa and/or Bolas and holds the Obzedat hostage or kills them and sticks around as leader. I expect Simic to be led by Ramaz, and Gruul/Rakdos to be led by Baltrice. I don't think they'll ever acknowledge that Matt Stover brought Baltrice back. It WOULD be interesting to finally get Ramaz. Currently, we have Liliana, Ral, Tezzeret, and Vraska in the quiver for team Bolas. Azorius: Team Unwitting Pawns. Azor's faction wouldn't help Bolas on purpose, but as long as he remains subtle (you know, before the Bridge opens and the Eternals attack), their red tape will hold up legitimate resistance mostly of their own accord. Jace owns their system, yet I think Bolas could game said system better. Once Bolas can be charged with destruction of public property, unlicensed materials transport, failure to pay tariff on his army, and numerous noise violations, the Azorius turn to defend Ravnica. Gruul: Team Bolas or Team Nobody. Gruul SMASH. Not Gruul? Then Die! The destruction bolas offers is to their interest, but they might just rage nondirectionally. Selesnya: Team Gatewatch, through Emmara. Orzhov: Civil War; Ghost Council is Team Bolas, Teysa is Team Gatewatch. This is probably where Kaya comes in as much as I dislike her. Simic: Team Gatewatch. With the Izzet firmly in Bolas' corner, the Gatewatch will probably need/want to acquire some mad science of their own to combat it. Perhaps fair-weather allies not ideological ones, but still allies. Golgari: Team Turncoat. Starts off in Bolas' claws under Vraska, but when Jace restores her memory, she flips and takes the guild with her. So now Maro has confirmed that two guilds in this set are pro-Bolas and in the next three will be. So that makes Izzet and Golgari the obvious candidates now. If they're keeping the colour balance then Azorius, Orzhov and Gruul are likely candidates for the remaining Bolas worshippers, the former more so since Isperia is dead and there is likely some puppet there. It would make sense from a practical stand-point, since the government and the church have the power to censor and control the masses and the oppressed rebels will have the most sincere support. Finally the Dimir can be seen for the heroes of Ravnica they've always been. Oh that’s interesting, another brand new character, can’t wait to see her card. So, are there only 5 planeswalkers in guilds + allegiance, and all of them are from the 5 guilds that are Bolas-aligned? I got that from your article and, if that's the case, that's very disappointing No gatewatchers/heroes? Guilds of Ravnica and Ravnica Allegiance are mostly concurrent with Ixalan and Dominaria so the Gatewatch is busy elsewhere storywise. That can't be correct...right? Like Vraska didn't leave Ixalan until after that story ended. Bolas made a body double and Monkey Pawed her wish. Yeah, at best it could take place in the time frame after Jace planeswalked to Dominaria, but that was already pretty late in the Dominaria story. He said 'mostly'. Vraska could appear later in the chunk of time that GRN represents. Maybe the isperia assassination happens at the end of the story? The Azorius aren't even trying. Izzet, Golgari, Orzhov, Rakdos, Simic. The only two I'm not really confident on are Gruul and Simic, but it would seem easier for Bolas to get in touch and persuade the Simic or subvert them than it would be the Gruul. Orzhov goes Bolas because he offers them the chance to get out from under the Azorius and Boros, while from a typing standpoint their flavor would more easily fit in with Lilliana's penchant for zombies and undead. I hope at least one guild is playing both sides. I don't think that's too complex right? Azorius confirmed to be on team evil as seen above, possibly due to a puppet replacing Isperia.